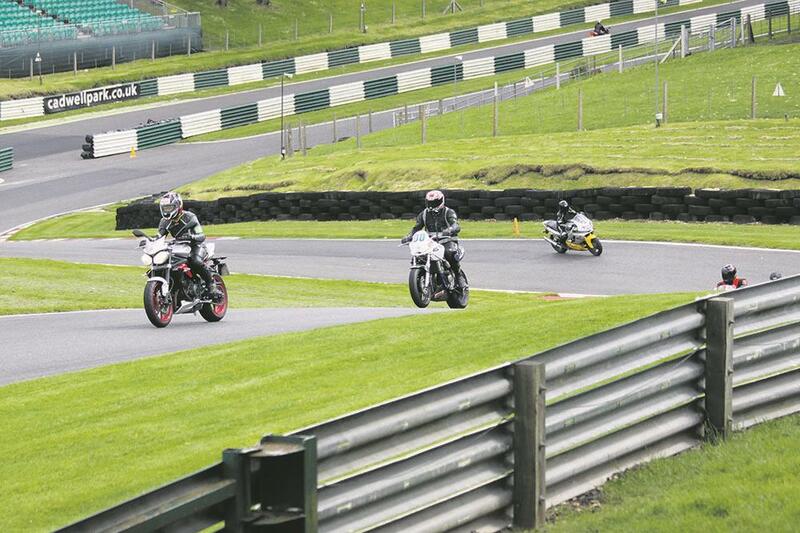 A bit of rain does not have to stop play as my Street Triple and I proved during a damp session at Cadwell Park. I had planned for my first time on track with the Triumph Street Triple Rx to be at Folembray in France later in the year but when the opportunity arose to visit Cadwell Park I couldn’t resist. I’m finding the Rx is much lighter, more nimble and generally swifter than the middleweights I’ve ridden in the past. I’m not scared of the bike, just a little on the cautious side still, and I definitely need to get to grips with it before setting out on my 1000-mile French excursion. I’d got the chance to take part in an instructional track experience, organised by Black and White bikes (www.blackandwhitebikes.co.uk), where I’d have my own instructor for the whole day. Kev Harper, a traffic cop and motorcycle racer, was the lucky chap to get paired with me. Over a cuppa we had a chinwag and discussed what I wanted to get out of the day. 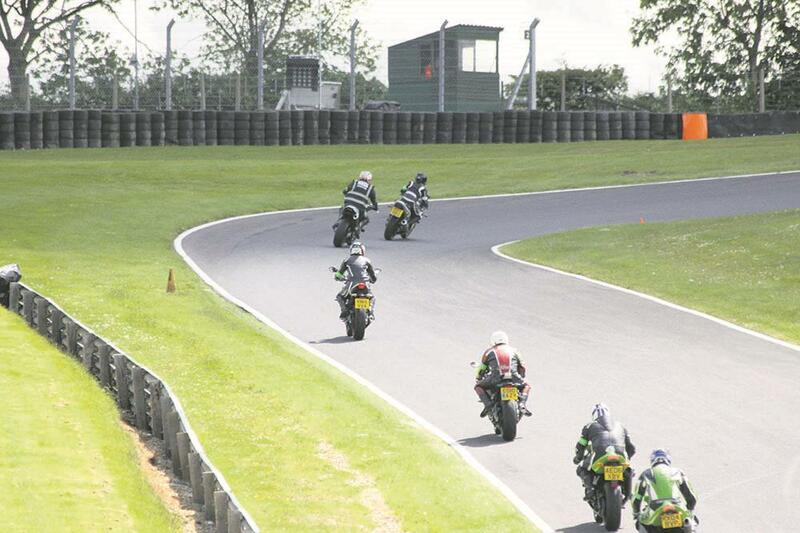 Cadwell is renowned for having its own micro-climate and as I arrived it was shrouded in cloud and bucketing it down. My preparation for track riding was minimal; with it being so wet my road tyre pressures of 36psi in both front and rear were confirmed as being spot-on by Kev. I had to take the bike to be noise tested, it came in at 100db at 6500rpm so was well under the limit and with sticker of approval in place I was free to take to the track. The weather was so awful that very few riders wanted to go out and rather than running in half-hour sessions as originally planned the organisers decided to run an open pit lane where we could go out and come in as we pleased. I don’t mind riding in the wet, so instead of cowering in a corner, I headed out on track. Kev initially took the lead and showed me which line to take before switching and letting me lead. I found that I wasn’t putting so much pressure on myself as I would if the track had been dry and I was riding without an instructor. It had been eight years since I’d ridden round the track, but I soon remembered which sections I enjoyed and which I didn’t. Over the years I’ve watched loads of races at Cadwell and I’m always in awe of how the professionals attack the Mountain. Me, I sort of limped over it, nervous of giving it too much and having a mishap. Having said that, I never once felt scared riding the Triumph and soon started to learn to open the throttle a little more when the opportunity arose. I did make a couple of mistakes with the Triumph’s quickshifter because I didn’t make a positive enough gearchange. I’m used to short-shifting through the box, but when short shifting you let revs off slightly while with the quickshifter I have to make sure I keep the revs constant and tap the lever. This isn’t a fault of the bike, more an operator error, and the track was a great place to iron out the issues I’m having as it’s a far safer place to learn than out on the open road. As the day wore on there was an improvement in both the weather and my confidence, and I felt much more comfortable with riding the Triumph – now I can’t wait to head to France later in the summer for my Folembray expedition. To read more on our 2015 long term test bikes, click here.